"I can't wait to go back and use these great ideas! I love the teachers' enthusiasm!" This workshop introduces teachers to the Thinking BIG, Learning BIG philosophy and strategies. Learn how the excitement of BIG activities energizes the whole curriculum while meeting standards. Use inquiry-based science to integrate math, literacy, language, art, drama and movement. Gain confidence in your ability to do interesting science activities based on children’s interests to build a foundation for high-level thinking. Learn innovative techniques to introduce vocabulary words and boost literacy. Learn how to weave BIG math activities into science topics to help children get a real "feel" for numbers. You will see that you don’t need to be a science expert or math wiz. All you need is a willingness to say, "Let’s try it and find out." See the classroom-tested ideas in a vibrant PowerPoint presentation featuring photos from Marie’s classroom. Learn how you can think and learn BIG even in small spaces with limited time and money. You’ll participate in activities that are arms-on, legs-on, whole-body learning that you’ll be able to share with children right away. Discover how Thinking BIG means Learning BIG. Kids love science and so will you after experiencing this workshop. Science is more than facts. It’s an attitude toward learning, a method of discovery. Discover what topics work well in early childhood classrooms. Choose a selection of science explorations from a variety of topics including wind, rain, ice, rainbows, earthworms and the moon. You’ll be able to try out specific lesson plans you can take back to your classroom. You’ll learn how to build on children’s interests and develop explorations. Learn strategies for children to document their work and discuss their discoveries. You’ll come away with many practical and inexpensive ideas you can use right away for arms-on legs-on, whole body learning that totally engages children. You’ll also take away ideas for assessment and ways to connect science with math, art, drama and literacy. You don’t need to be a math wiz to do math with children. Find out how popping popcorn helps kids learn math skills. 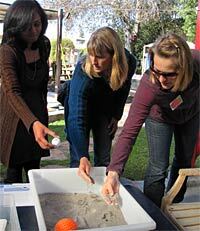 Learn how to make pretend “moon dust” so children can practice measuring and comparing sizes. Learn how games give children a real feel for numbers. Large-scale activities make math concepts come alive while meeting standards. The workshop will teach you arms-on, legs-on, whole body learning that you can use to engage children right away. See how BIG math equals BIG Learning plus BIG fun. Learn fun, easy and inexpensive activities that promote a sense of discovery and lay a foundation for increased comprehension in this program designed for parents and children ages 3 to 8. Find out how you can build math and science skills at home while playing games. Experience innovative techniques for boosting vocabulary, and learn about great books which explore concepts. Plan a customized presentation. Groups typically start with the Thinking BIG, Learning BIG overview then add elements of BIG Science and BIG Math. Choose a selection of science and math explorations from a variety of topics including wind, rain, ice, rainbows, earthworms and the moon. Try gross motor games, drama and art to expand the learning and engage children. Talk to Marie about what would work best for your group.